Haven't we already reviewed this card? No, I guess not. Well, anyway, I did an article on a Sek'Kuar deck that articulates my feelings about it fairly well, but basically it's an ability that black, red, and green can get a lot of use out of, for a reasonable yet color-intensive cost. The 4/3 body, legendary status, and three-color cost are all hindrances, but there's a deck to be built here. This guy is so much fun. He still lacks a bit for constructed play, since he is a 4/3 creature for five mana (of three different colors). But for limited and casual play, this guy is a superstar. He effectively give you a creature every time one dies. This obviously brings a target on his head, but if they don't have a way to deal with him, you can get some good board advantage. Jordan Kronick Sek'Kuar, Deathkeeper - How does one "keep" death, exactly? The world may never know. Anyway, a legendary orc has been a long time coming. And we finally got one and it's three different colors! That's alright though. It's a neat card. The 4/3 body is reasonable for the cost. And it makes nasty graveborn tokens that can be a real pain for some decks to deal with. The only real problem here is the mana cost. Three different colors can be hard to pull off in limited environments. 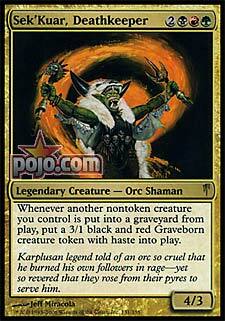 And, while I like Sek'Kuar, I don't think that constructed is where he's going to shine any time soon. This isn't Ravnica block constructed, either. Sek'Kuar lives in a world with very little dual-color mana production. Let alone three colors. To top it all off, red-green-black seems like a somewhat ineffective color combination in Coldsnap limited. This all adds up to a decent card that just showed up in the wrong set at the wrong time.